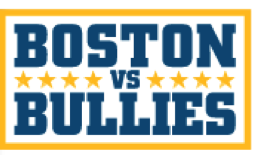 As part of the Sanford School Department’s efforts against bullying, students in grades four and five across the district are participating in the Boston vs. Bullies initiative sponsored by the Boston Sports Museum and the Boston sports community. The bullying prevention program incorporates interactive lessons and videos featuring athletes from Boston’s professional sports teams sharing their stories and providing kids in our community with strategies to stand up strong against bullying. Students learn what bullying and cyber bullying are and what they can do when they encounter bullying. In addition, students learn the skills and strategies they can use to create a positive and welcoming environment for everyone. The program has reached over 75,000 students in New England. Sanford is the first school in Maine to use Boston vs. Bullies in their schools. The Sanford School Department would like to thank the Maine Sports Hall of Fame and Daryl Forte for bringing the program to Sanford. Fourth graders learn about teamwork and using power in a positive way during a team building activity.